Transmog enthusiasts or Heritage Armor fans in general have something to look forward to with patch 8.1. In Tides of Vengeance, new sets are going to be added for non-Allied Races. 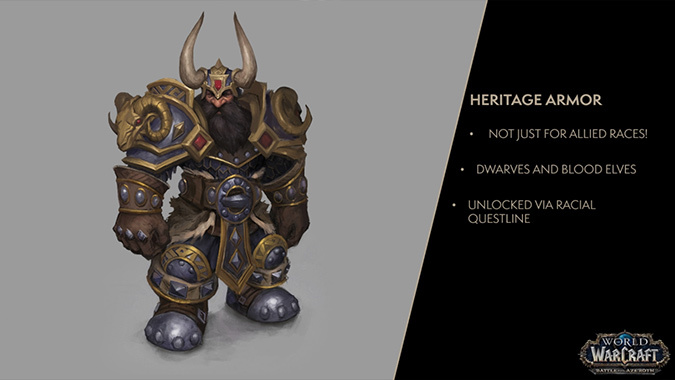 At the moment, the plans appear to be for both Dwarves and Blood Elves to get all-new sets of Heritage Armor. There is no new rep grind needed for these sets — if you’re a max-level character and Exalted with your own faction, you can log in and jump right into the quests. Ion described the quest series as a chance for players to explore the histories of these two races. For Blood Elves, the history of the Dead Scar in Silvermoon was given as an example of what you’ll be learning about during the quests. I imagine the Dwarves may just be learning a little more about the War of the Three Hammers while they’re at it…or heck, there may be another period of Dwarven history we’ll be exploring. Regardless, Ion pointed out that racial identity is something they’d like to focus on, so this gives Blizzard the opportunity to fill in the story a little bit for players who may be unfamiliar with past lore. Speaking of reputation, Blizzard also heard people’s concerns regarding the reputation system in Battle for Azeroth loud and clear. 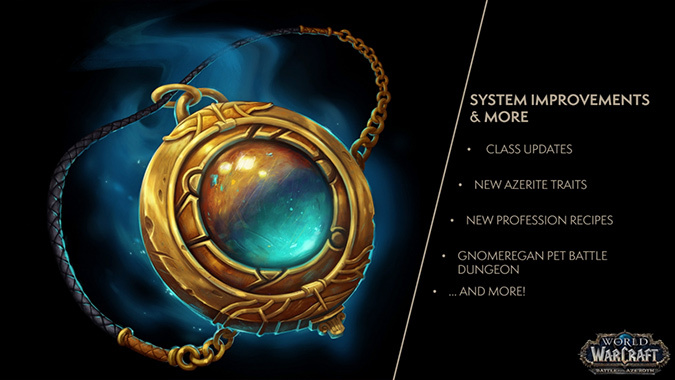 In patch 8.1, the Champions of Azeroth reputation you’ve earned on one character will effectively become account-wide — at least as far as upgrades are concerned. This means you’ll be able to get your Heart of Azeroth’s item level up right away on your alts once Tides of Vengeance hits. And in regards to reputation and transmog, there’s a change in the works for reputation-restricted armor. Right now, you can earn Exalted reputation with an Allied Race on one character, unlock that Allied Race, level that Allied Race to 120…and still not be able to equip that Allied Race’s tabard because your Allied character doesn’t happen to be Exalted with their own faction. It’s downright silly, which is why Blizzard is pretty much wiping all reputation-restricted requirements. Once you unlock that racial tabard, you can use it on any character on your account. More importantly, once you’ve unlocked a reputation, it’s considered account-wide progress for Achievement purposes. This means that Achievements that count earned reputation are going to track your progress on an account-wide level, instead of by individual character. Suddenly, it’s looking like it’s going to be a lot easier to get that coveted 100 Reputations Achievement and the associated mount. This does not, unfortunately, mean that reputations will count as being earned account wide. If you want reputation-locked recipes on different characters, you’ll still need to grind that rep out. But at least it’ll be easier to get those upgrades for your Heart of Azeroth on your alts. As for transmog enthusiasts, between new Heritage Armor and the removal of reputation-locked appearances, we’ll have even more options to play with when patch 8.1 arrives. When exactly that will be is up in the air, but the PTR should at least be up by the end of this week.